There are many possible ways to start your own business. There are multiple business models you can choose from to imply one for your startup. The marketplace business model is one such option, the booming entrepreneurs can indulge in. A marketplace business model is a platform where the buyers and sellers meet. Marketplaces are platforms with both distinct groups and no inventory. The marketplace business model is a vast sea having different ways of implications. In this article, we will look into several categories of a marketplace business model and deep dive in the online marketplace world. Online marketplaces are very successful because of a lot of features provided by marketplace business model. The marketplaces operate on a simple rule; they work as a meeting junction for buyers and sellers to buy and sell products respectively and the mediator i.e. the Marketplace Company earns the commission without any investment. This creates a win-win-win situation as all the three parties involved benefit from this platform. There are several examples of marketplaces using these business strategies like Airbnb that has an amazing business model that has revolutionized the vacation rental industry. The Airbnb business model is based on the Sharing economy strategy. Let us discuss in brief all the categories of marketplace business model. In this model, there are two types of users and they use the same interface, the buyers as well as the users. For example, Airbnb has the same app for the users looking for a place to rent and the ones providing the rental service. The service providers can use the same app to book services for themselves. This model is used to share underutilized resources. This way sharing economy is preferable for marketplace companies who are providing services that can be useful to both and can be shared by both types of users. In this model, the marketplace operator gives an opportunity to the users to give any type of service they could provide on the basis of their skills and the buyers are the companies that require those tasks to be done. These companies hire such gig freelancers to avoid paying full-time employees for smaller tasks. But if the freelancer forms a good reputation and star rating, they could earn a whole livelihood from the freelance/gig economy. Fiverr is an example of such a business model (read – how does Fiverr work?) . The platform is used by sellers to create gigs and earn by selling gigs to the buying companies. The marketplace platform earns money by getting commissions from both parties. The peer economy strategy is quite similar to the sharing economy but these platforms work on P2P networks. The peer economy brings together individuals instead of businesses. The only difference between sharing economy and peer economy model is that the marketplace platform provides different user boards for sellers and buyers in the peer economy model. For instance, Uber has different user boards for the drivers and the riders. The drivers cannot hail a taxi from their seller account likewise, the riders cannot opt to drive a taxi from their account. The crowd economy is based on the crowdsourcing. This model is useful for a more purpose-driven ecosystem. This model has five major factors: people, purpose, platform, participation, and productivity. This model gives a platform to productive people to participate in mutual beneficial goals with a purpose. Crowd funding and Crowd lending are examples of this model. For instance, new entrepreneurs run crowd funding campaigns to get the startup funding and the people who participate in the funding generation get their outcomes on the decided time. The Teespring business model (read – How does Teespring work?) is one such model where the sellers run campaigns to get their designs printed and after the completion of the target goal, they get paid. The on demand economy is more about access rather than ownership. This concept is similar to freelancing. The workers connect to the clients to perform tasks as needed on a temporary basis. This economy works by taking a service, e.g., dog sitting, meal delivery or beauty care. Then when a customer is in need, they connect to the service provider. This way, there are many ways to execute the marketplace business model but you have to decide the right model that can fulfill the purpose of your business and improvise your idea. After knowing all about the marketplace business model, you may be keen to start an online marketplace platform. But that is not all. You need to think of an effective and scalable business model with a profitable revenue stream. Just like there are different strategies for executing the marketplace business model, there are different revenue streams. For starting a marketplace business, it is important to select a business model and a monetizing strategy that would allow the scalability and viability of the platform. For this, you need to decide the most fruitful revenue stream for your model. Let us discuss different ways in which a marketplace platform can generate revenues. Huge businesses like eBay, Uber, Airbnb, today run on the commission basis. In this, the revenue stream is generated by charging commission from the buyers and the sellers. The question lies in whom to charge and how much. It depends on whether your platform leans more on the demand side or the supply side. If you need buyers more, you can charge the sellers more, likewise vice versa if the case is opposite. Again, there are two types of fees: Fixed Fees and Variable Fees. The Fixed fee is a set percentage charged by the marketplace owner from each seller and buyer. The Variable fees are adjustable. They’re charged on the base of per product or service or the total amount of bill. This way you earn from each and every transaction occurring on the marketplace platform. Subscription fees are widely used by many companies these days. The subscriptions reward you with the assurance that you get recurring revenue and once you get a user to subscribe to your marketplace platform, you don’t need to spend too much on ad campaigns. Marketplace platforms like eBay use subscriptions as a part of their business strategies to earn recurring revenue. In any freemium service, the company offers a product for free and charges the users for upgrades. There are two ways to implement the freemium service, either you give free service and charge extra for upgrades or you give free as well as paid products. Amazon works on this revenue model. It has Amazon Prime that serves its premium purpose. This revenue stream comes in handy when there are no monetary transactions in the marketplace business model. In this, you can charge the vendors to list their products. These fees can be charged on regular or premium bases. You can also charge listing fees for promoted ads and other such features. OLX works on this strategy by providing featured ads. This strategy can be helpful when you’re providing a platform for occasional users and do not want to bind your users with subscriptions. In this, the sellers pay to get in contact with the buyers. This is better than the listing fee model as the sellers have to pay only when they are put in touch with a potential customer. This way the company gets the revenue by charging the sellers to get in contact with the customers. The vendors can view the details of the job and if they find themselves fit for the service, they can get in touch by paying the company. Thumbtack is an example of this revenue model. 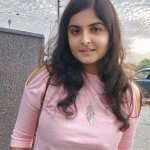 You may also like A Study on Unique Dating Website: How Does Zoosk Work? Why the Marketplace Business Model is a Right Choice for Startups? The marketplace business model is one of the best choices for startups mainly because of its no inventory factor. The major part of any startup funding is invested in the products and the workplace, however, with the marketplace business model, you can start your business without spending an arm and leg. One of the best examples of a successful marketplace business model is the Alibaba business model. It became famous for providing Chinese products all over the world without owning a single product. This is the benefit of the marketplace business model, it focuses on access over ownership. You can run your startup without any inventory and office, as your buyers and sellers will sign up on your platform online hence you can conduct your business online. Let us see some examples to know the execution of these strategies and revenue streams better. The marketplace platform has brought a change in the online economy with advancement in technology. In a few years, we’ve seen a tremendous number of innovations in the marketplace platform. Let us see some examples of the most successful executions of the marketplace business model. Amazon started out as a bookstore in 1994 and is a vast economy serving everything today. While it follows a marketplace business model, it generates its basic revenue on commission bases and also earns listing fees by offering subscriptions. Anyone can become an Amazon seller just by signing up for it without paying any listing fees. Similarly, there are no fees for buyers to sign up for buying. The subscription fees are charged for Amazon Prime for updated features. Therefore, Amazon follows a multi-sided business model but its core business works on the marketplace business model. A company with zero value that has turned to a unicorn company, today stands at a valuation of $72 bn. Uber is a taxi booking app that works on the on demand and P2P economy. Uber promotes 15 million rides a day without owning a single cab, this proves the earlier discussed point that the on demand economy is about access rather than acquisition. Uber charges commission from the riders as well as the drivers. It has other revenue streams too like UberEATS, UberFreight and UberElevate. However, it has different pricing for rush hours, holidays, night time, etc. Therefore, the Uber business model is one of the most successful marketplace platforms. Airbnb is a company that made use of underutilized resources like a spare room that could be accommodated to the travelers as a bed and breakfast service and the host would just have to sign up for it, rest is all taken care of by the company. This way Airbnb has brought about a huge change in the vacation rental industry. Airbnb business model is a mix of Marketplace and Aggregator business model. It earns revenue on a commission basis from the hosts and exchange charge from the travelers. The host and the traveler use the same interface offered by the company becoming a part of the sharing economy. After knowing all about the marketplace business model, let’s have a look upon the after effects of building an online marketplace. With the knowledge of benefits and challenges faced by building an online marketplace, you will have a better understanding of the functionality of the marketplace business model. No Inventory:As in an online marketplace there are buyers and sellers, you as a marketplace operator do not hold any products in your inventory. You have sellers who manage their products and hence you do not incur any inventory losses as well as you don’t have to invest your funds in products. A Wide Range of Products:With the increased number of sellers, an online marketplace provides a large number of products. Similarly, for a gig economy, for instance Fiverr, it provides a wide range of gigs as the number of participants is more and the number of buyers is more and there is a demand for all kinds of gigs on a single platform. Deeper Customer Engagement:With the increased number of products and services provided on a single platform, the possibility of deeper user engagement is high. For example, a grocery shopper would prefer a supermarket providing larger product selection instead of going to different retail shops. Bigger Brand Building:In an online marketplace, there are a large number of sellers providing different products that are recognized under the brand of the marketplace operator. Depending upon the quality and selection of products or services and other factors, customer loyalty increases if the model is executed well. Low Margins: The profit margin is low as per the commission rate; generally 10-20% which is insufficient to cover the cost, in the early stages of business. But the cost is also comparatively low to other business models as you don’t invest much in this. Product Quality and Brand Control: With a large number of sellers comes a huge responsibility for maintaining product quality. For building a brand, the marketplace operator may face challenges to uniform the quality and services provided by different sellers. The responsibility to maintain the brand image is of the operator as the products and services are sold under the marketplace brand. Product Returns: This is a big problem for an e-commerce marketplace. Imagine a customer wants to return a product they’ve bought from the third-party seller from your platform, where will the customer ship it to? Who will pay for the shipment? This could all be taken care of with policies formed beforehand. Customer Service: A customer buys the products on the marketplace platform therefore in the customer’s view, the primary source of product or service provider is the marketplace company. It is a little bit difficult to keep a track of such large product range and orders and shipments but this could be handled by a well-trained customer service team. Building an online marketplace may not be as easy as it seems but don’t worry! We’ve got it all worked out for you. Take a look at our blog “..” for more information on a multi-sided platform. How to Start an Online Marketplace? 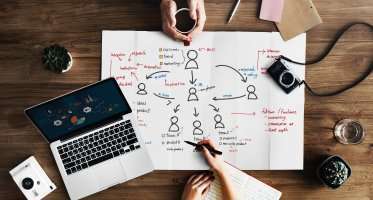 By now, you know everything important to know about the marketplace business model and if you’re intrigued enough, let us share with you a few thoughts upon how you can start your own business using the marketplace business model. After looking at the famous examples, if you do not want to copy their strategies, you should understand your own niche and focus on how you can monetize your model by using the right revenue stream. The commission model is the most scalable one, however, in some cases, it cannot be used hence you can use other alternatives. In the beginning, start with a basic model and single revenue stream to keep your business model simple. Eventually, you can combine different models and generate more revenue with the use of other streams once your business starts to grow. If you’re intrigued by the famous businesses and want to build a similar marketplace, we at NCrypted, provide ready-to-deploy clones for every such website out there. We also offer customizations if you want to add your own color to your website. Get in touch to know more. 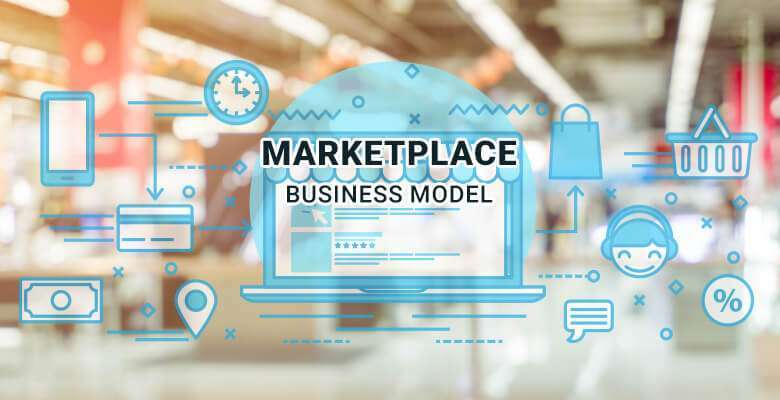 If you’re tantalized by our blog “A Guide to Marketplace Business Model and Examples of Online Marketplace Companies”, let us know in the comment section below. I enjoyed your concise explanations and real world examples, especially useful in getting one’s brain around the business. it is usefull..